It’s unfortunate that China’s Hunan province tends to gets very little press other than as the Trivial Pursuit answer to the question of Chairman Mao Zedong’s birthplace. Though an important regional hub, it has nevertheless tended to cede the limelight to nearby Guangzhou. Even more obscure is its ancient capital Changsha, though, if the city of six million continues to produce more restaurants like the Noodle Rack, it won’t be long before this 2,000 year old city gets its long overdue close-up. Designed by the Shanghai-based Lukstudio, the restaurant is set in a mixed-used development with a fruit juice stall, ladies’ boutique and spa as its immediate neighbours. 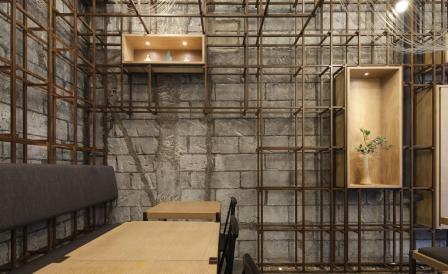 Styled like a traditional hole-in-the-wall street stall, the entrance, clad with bamboo-cast concrete and a vitrine framed with steel grids, leads into 50sqm space dominated by a central bar counter. Overhead is a light installation comprised of draped loops of thin metal wires that evoke the hand-made noodle drying on racks. The menu is based on Shaoyang-styled rice noodles lounging in a soup doused with a spicy oil made from freshly pressed canola flowers, though the less fiery option of beef noodles soup followed by a dessert of sticky rice and brown sugar is equally satisfying.